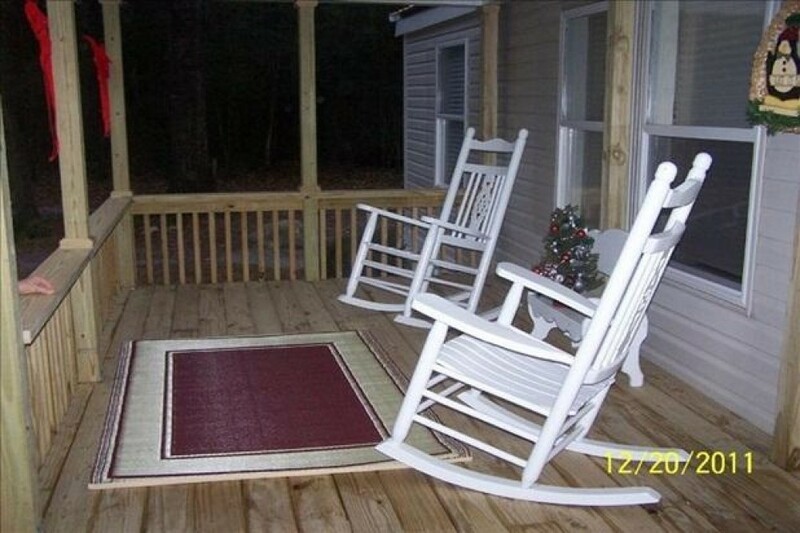 Do you want to have your morning coffee and watch the sun come up while sitting on the front porch in the swing or in the rockers listening to the birds sing; away from the noises of city life, traffic and stress? Then this is the place for you. Our Wakulla Springs Retreat is located on 5 secluded acres of hardwood trees off the beaten track but close to the Tallahassee-St. Marks Historic Railroad State Trail (15 miles of a beautiful paved bicycle corridor), Wakulla Springs State Park, the St. Marks National Wildlife Refuge, the Apalachicola National Forest, the San Marcos de Apalache Historic State Park in the town of St. Marks at the confluence of the beautiful St. Marks and Wakulla rivers, the Felburn Foundation Playground with covered picnic tables and a fabulous array of playground equipment. There are several excellent sea food restaurants close by so you don't have to spend your time cooking. Only 3 miles from the Retreat is Savannah's (home of the famous $2.00 breakfast and a great country. fenced in back yard with a Large deck where you can cook on a gas grill. Deposits: A fifty percent (50%) deposit is required when making reservations. The balance will be due 30 days prior to arrival. Deposits will be returned for cancellations made more than 30 days prior to arrival date, minus a $50 cancellation fee. No refund offered for cancellations made 30 days or less to arrival date. Other Fees: Pet Fee: $10 per day per pet. Prior approval of pet(s) is required. This place had everything you need ... so you can focus your time on other things. We had 4 adults and 1 child and were all comfortable. The fenced in yard was great for our dog and the big deck was nice for all of us to enjoy the outdoors. We noticed that the owners had taken the suggestions from the guest book so you know they care. The place was well maintained and close enough to the city but far enough away to feel like we were on vacation. We especially enjoyed going to Wakulla Springs and the riverboat trip. We recommend that for all ages. We also enjoy cycling, running, or just long walks and the trail nearby is paved and goes for 16 miles and is mostly shaded. Bring your bike and enjoy the outdoors. We stayed at the cabin this past weekend while visiting Tallahassee for FSU-BC football game. From the beginning the process was very easy. Floyd and Carolyn were very prompt in their replies to my questions and reserving the space was easy. The information they sent out beforehand was thorough and informative. Hooking up with Floyd was very easy. He was very friendly and quickly got us to the cabin. I was impressed that the UF grad was flying a Noles flag on the cabin because he knew we were coming for the game. An added bonus that I wasn't expecting was wireless and since we weren't sharing with an entire hotel it was very quick. The cabin was nicely furnished and had everything we needed. I wish we weren't so busy so we could have enjoyed the porch and the back deck more but they were great. Although we didn't see any deer as others have mentioned, we did see many birds hanging out at the feeders. We ate breakfast everyday at Savannah's and that is a great recommendation. Big fan of their grits. We also headed down to Pancea to the gulf marine lab with our marine biology FSU student which was a nice drive. Overall, it was nice to be a little out of town to escape the chaos of Tallahassee during a game weekend but not so far that it was an inconvenience. Pictures of the cabin are very accurate and I really enjoyed my stay. We rented this property for the 4th of July weekend getaway. Both of our boys attend FSU and this was not only convenient for them to get to but also out of the city and close to the St Marks river where we were going out on the boat. We were a little late getting there and Floyd and Carolyn were very accommodating. The house was in excellent condition and very clean, it had all the amenities we needed. The back deck with the grill was great as we cooked out and enjoyed the outdoors and peace and quite. This is a great get away for anyone looking to come to this area we will most definitely be back again! Thank you for everything Floyd and Carolyn! !